Poppy was adopted by an amazing family! They absolutely adore her, and Poppy is insanely in love with her new mama. She is also in love with her new Frenchie brother. They love cuddling together. 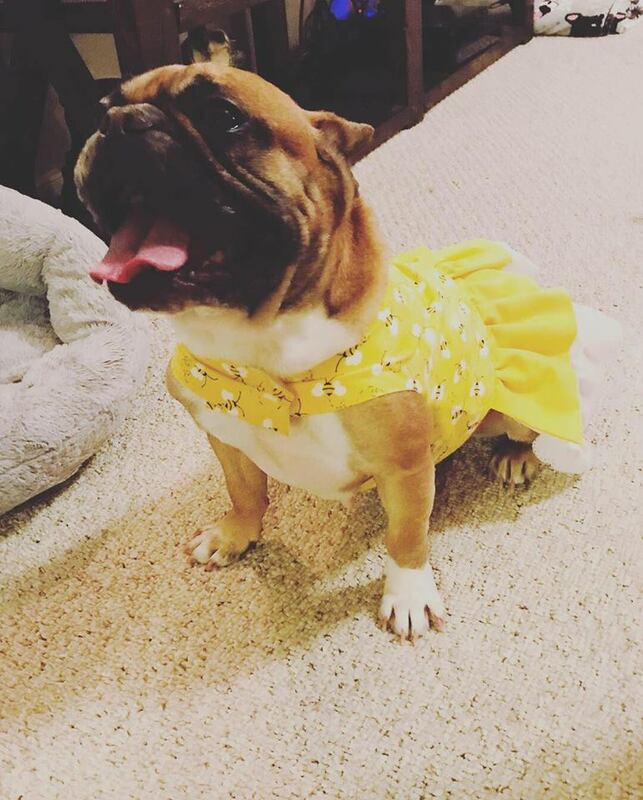 Poppy is being spoiled with new dresses and accessories by her mama! She looks so adorable in clothes! FBV is very happy for this new family and wish them many happy years together. Guess who is ready to be adopted…PRINCESS POPPY!!!!!! Yes, we call her our resident princess, because this girl is a DIVA in the making! 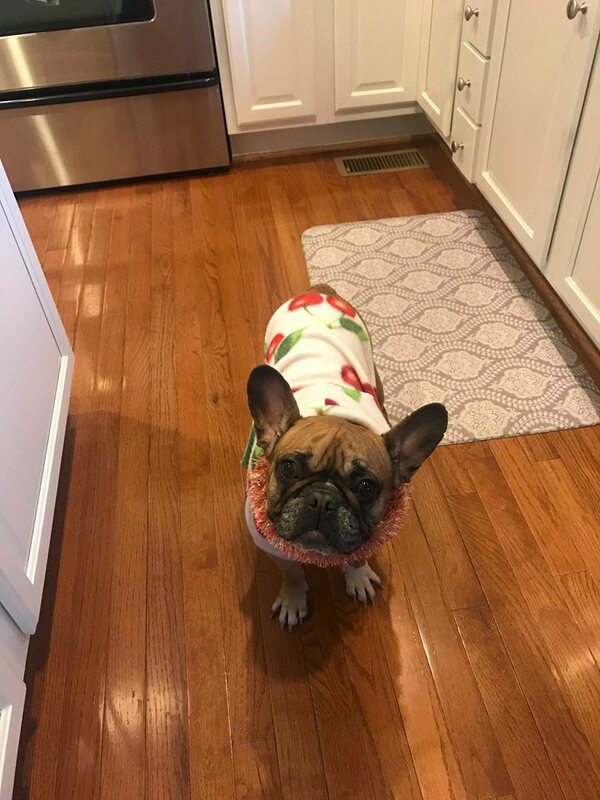 Poppy came to French Bulldog Village from another rescue that realized they did not have the vast knowledge to care for a French Bulldog that has IVDD (Intervertebral Disc Disease). When Poppy came to FBV, we knew that she had had an episode of weakness in her backend a few months prior to coming into our care. We placed Poppy with our foster who is familiar with IVDD, and she monitored Poppy’s status. Poppy showed weakness mainly in the backend and some in the front left leg. She was very wobbly and had a hard time keeping balance on her back legs. Her gait is a little wonky as well. As she was exercised properly, she grew stronger and the weakness began to get better. Foster mom took Poppy for a neurological consult, and the neurologist wanted to try Poppy on medication before doing an MRI. We knew from the radiographs that Poppy showed mineralized disk damage in all segments of her cervical, thoracic, and lumber areas as well as a Congenital Spinal Malformation! Once Poppy began her medicine regimen, she slowly came out of her shell! 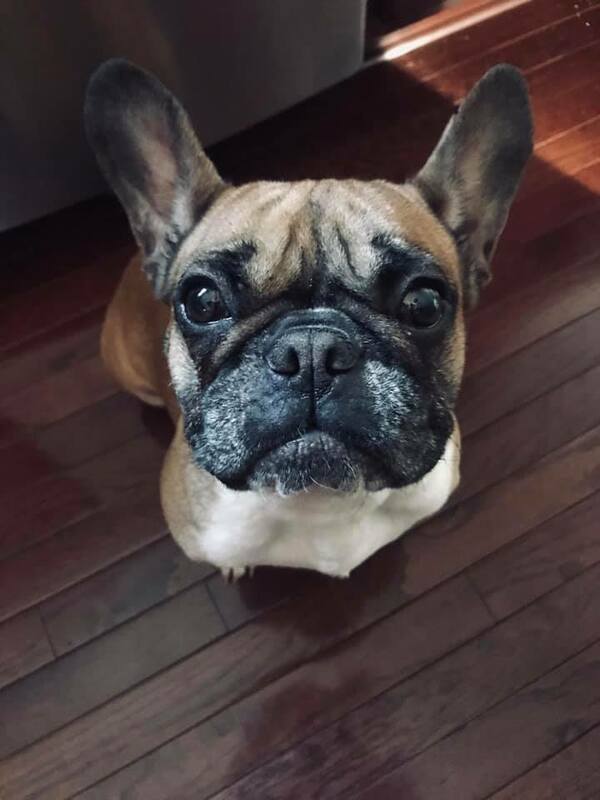 She is a complete goofball; she loves to do zoomies and play with the resident Frenchie brother. Although Poppy did not require surgery at this time, this DOES NOT mean that she will not possibly need surgery down the road. IVDD is a tricky disease and has to be closely monitored. It can be a VERY expensive venture as well. We want everyone, before applying for Poppy, to realize this harsh reality. Poppy IS and will ALWAYS be an IVDD dog that could or could not require surgery down the road. Although she is stronger now, this does not mean she is 100%. As with any IVDD dog it can happen more than once…this is a lifetime issue for her and will require due diligence in keeping her healthy. 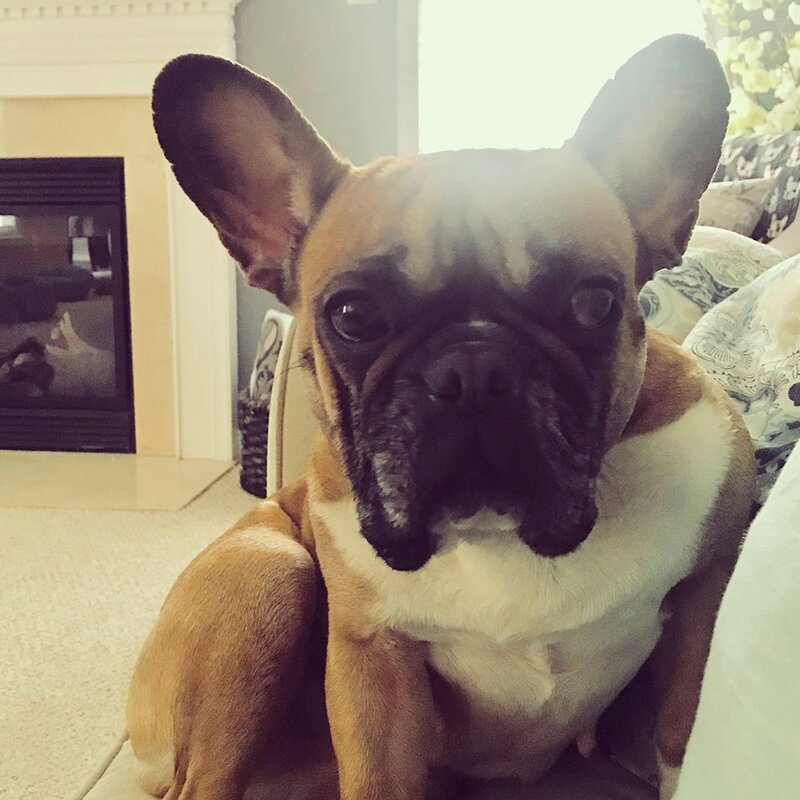 IVDD is a common disease with the Frenchie breed and takes a great amount commitment from the owner to maintain and handle. If you are unsure of how you would be able to handle Poppy if she ever required surgery or became paralyzed, please do not apply. Poppy is also not a candidate for pet insurance to cover the IVDD because she has already had an episode. However, if you think this Princess is for you…please read on. 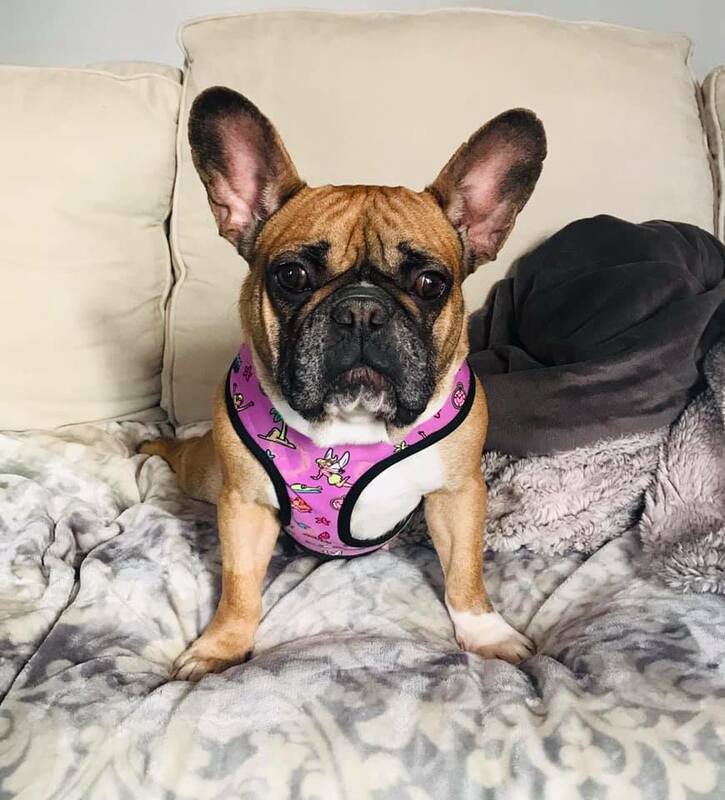 She is still a typical 3 to 5-year-old Frenchie and loves to play etc., but her play must be monitored. She should not jump onto furniture or go up and down steps. Poppy uses a ramp to get on the sofa in her foster home; the steps are blocked with baby gates. Poppy is learning to maneuver hardwood floors, but carpet is better for her. Poppy knows her limits, but as with any Frenchie, she is stubborn and will push those. Poppy should not go into a home with another dog who is overly active as her body will not be able to handle it. Poppy is highly intelligent and is learning basic commands…she is highly food motivated! She LOVES food and will do anything for a treat! Foster parents have taken Poppy all kinds of places and she is a dream. She focuses her attention on foster mom and ignores anyone else in sight, unless they want to pet her, then game over. She loves to be touched and wants constant companionship from her foster mom. She is the definition of a Velcro dog. She loves when foster mom comes home and does little twirls for her. 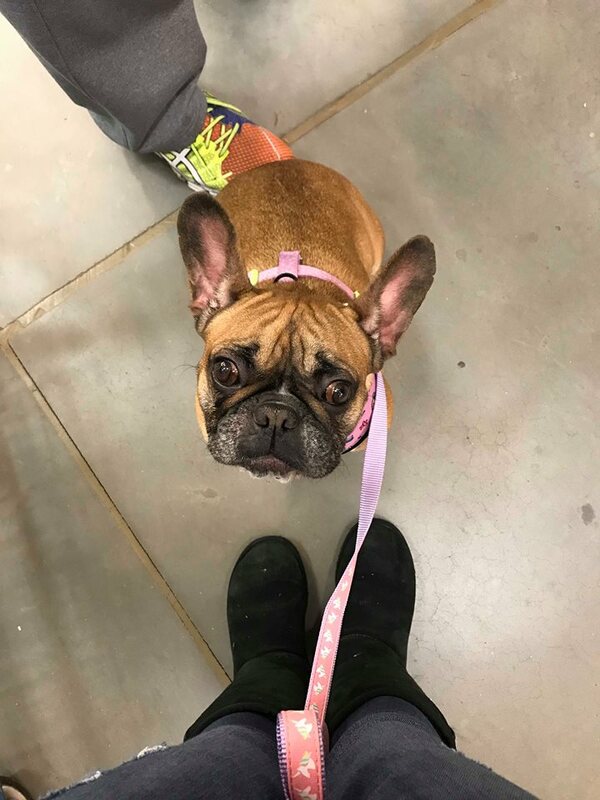 Poppy is a laid back girl with the typical bouts of Frenchie energy. She loves everyone and anyone she meets. She has not met a person nor an animal she hasn’t been able to win over. Poppy’s beginning has been rough and all she wants is someone to love her unconditionally. 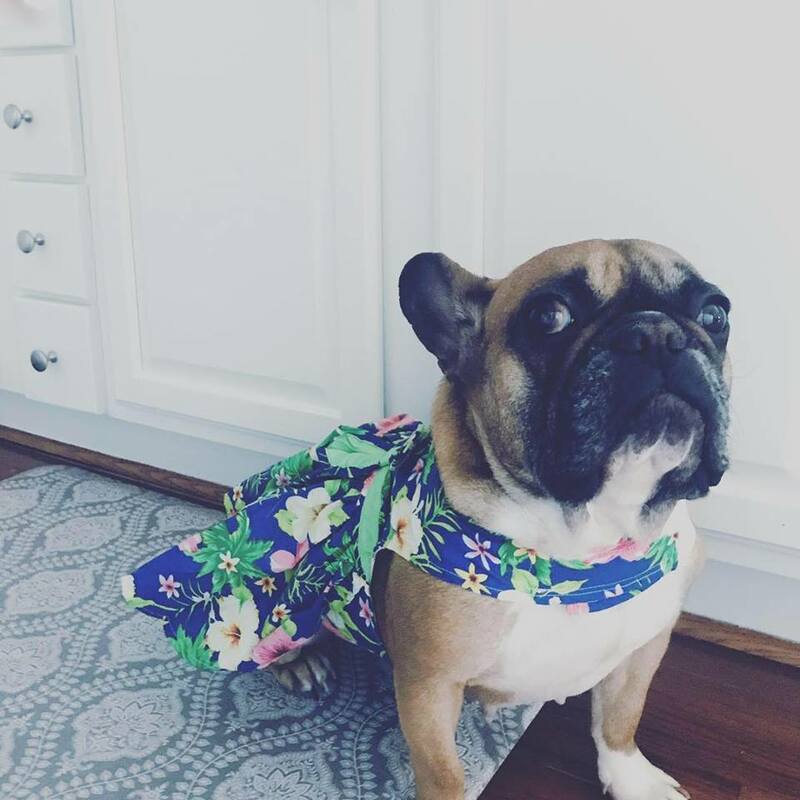 She seeks love from the resident Frenchie brother, and honestly they have fallen in love. They groom each other and lay together all the time. Resident brother has taught Poppy how to get on top of the sofa and sleep like a cat, and it is one of their favorite things to do together. They both play, but both have low energy levels. 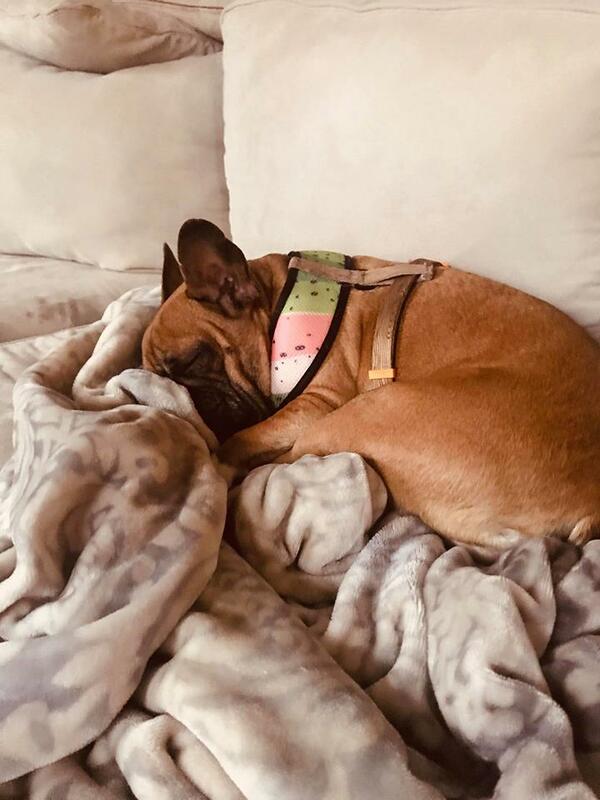 Resident Frenchie is an IVDD dog as well and knows his limits and has taught Poppy the joy of being lazy! Poppy is fully house trained which is a win!!! She does not like to go outside in the rain or snow, but refuses to use the potty in the house! Poppy loves to stay under your feet especially in the kitchen, you must be mindful of this as you will trip over her! And let’s just say it isn’t fun. Remember the saying if you build it they will come – well with Poppy…if you have food, she will be right there! She does not beg when you sit down for dinner but she will be watching closely. Poppy is fully crate trained and loves her crate. Poppy loves toys especially her bones and antlers! Poppy loves to lay with her human’s and get belly rubs. She is a dream in the car and pretty good on a leash. Do you have what it takes to make this Princess into a DIVA for life?